Vegetarianism lies at the center of a contested ethical field in Tibetan Buddhism. On the one hand, the vinaya (the rules of monks) explicitly allows monks to eat meat. On the other hand, Tibetan Buddhism idealizes the practice of compassion, and expects practitioners to focus their efforts on relieving the suffering of all sentient beings—a category that explicitly includes animals. Finally, many sets of tantric vows actually require practitioners to eat some meat. In this paper I will discuss this tripartite ethical tension surrounding meat eating, exploring each of these three perspectives as well as the ethical and rhetorical strategies Tibetan thinkers have used to understand and reconcile these disparate views. Geoffrey Barstow is an assistant professor of religious studies at Oregon State University. His research focusses on the history and theory of vegetarianism in Tibet. 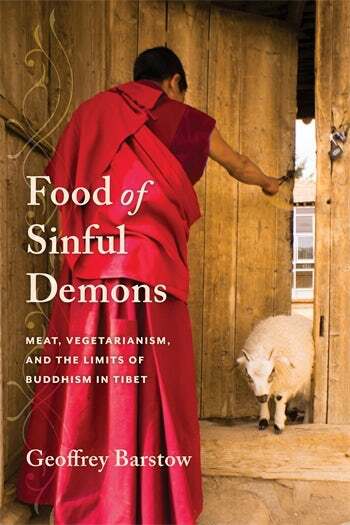 He is the author of Food of Sinful Demons: Meat, Vegetarianism, and the Limits of Buddhism in Tibet (Columbia, 2018) and the editor of The Faults of Meat: Tibetan Buddhist Writings on Vegetarianism (Wisdom, forthcoming fall 2019).